“Show me your teeth and I’ll tell you who you are.” These words, attributed to 19th-century naturalist George Cuvier, couldn’t be more correct. The pearly whites we use every day over and over and over again are clues not just to our own individual lives but also to our evolutionary history. Teeth lock into their physical structure remarkable detail about the creatures whose mouths they’re in, whether our own or those of our ancient ancestors. 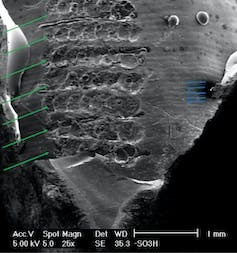 Fossil teeth are tiny time capsules that provide insights into human evolution, including our diverse diets, extended childhoods and other unique features of our species. In my book, “What Teeth Reveal about Human Evolution,” I explore what anthropologists like me have learned about the past from teeth – and what our own teeth may tell future anthropologists about us. Chemical evidence of diet rests on the principle that you are what you eat. Plants using different photosynthetic pathways incorporate various proportions of carbon isotopes – called C-13 and C-12 – into their cells. 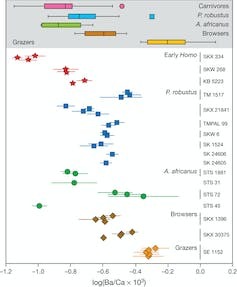 Chemists know that tropical grasses and sedges (C4 plants) have proportionally more C-13 in their cells, while other plants, like trees and shrubs (C3 plants), have proportionally less C-13 in their structures. As tooth enamel forms during childhood, it locks the ratio of ingested C-13 to C-12 into its dense mineral structure. That ratio, which can be preserved unchanged for millions of years, allows anthropologists to determine what kinds of plants ancient teeth were chomping. 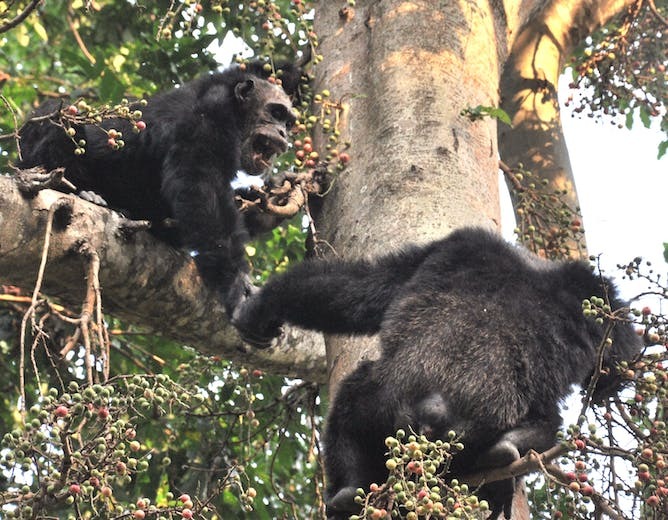 Chimpanzees, our closest primate relatives, eat a variety of foods; however, the fruits, nuts and seeds they eat primarily come from trees and shrubs. Analyzing the ratio of carbon isotopes in tooth enamel, researchers found that as far back as 3.5 million years ago, Lucy’s species, Australopithecus afarensis, diversified beyond the chimpanzee diet. 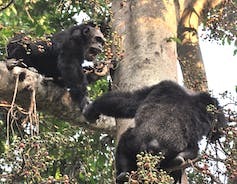 These early human ancestors not only ate from trees and shrubs like chimps, but also from tropical grasses and sedges, something chimpanzees don’t do even when these plants are available. That shift in diet is consistent with the diversity of environments Lucy and her kind inhabited: from woodlands to open grasslands. 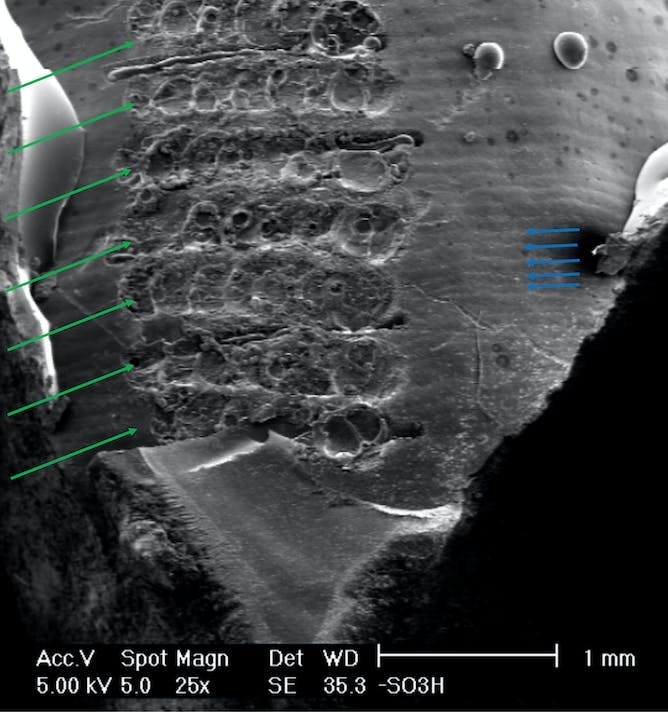 Teeth tell us our ancestors were moving beyond the forests into new territory and eating what they found there. From other chemical elements found in tooth enamel, anthropologists have learned that early members of our genus – Homo habilis from South Africa – ate large quantities of meat. This signifies further dietary diversification beyond the generally small amount of meat that chimpanzees eat. It’s not such a far cry from here to Anthony Bourdain – we humans eat an enormous variety of foods. That versatility probably contributed to our ability to survive in a variety of environments and, ultimately, to our evolutionary success. Another uniquely human trait is the extended length of our childhoods. Among primates, humans take the longest to grow up and become reproducing adults – and the length of time teeth take to grow and erupt into the jaw reflects that fact. While chimpanzee first molars generally come in at around four years of age, those of humans usually do so about two years later. Like trees, tooth enamel grows in layers. Tree rings represent yearly growth; growth lines in enamel form much more quickly. Enamel retains daily growth lines as well as growth lines representing longer periods, centering around eight days. Though we reliably see this eight-day rhythm, it’s still a mystery what that time period reflects, biologically. Anthropologists can count growth lines in fossil teeth to gauge the rates at which teeth developed in our ancestors. Are they more like chimps or more like us? In individuals who died before all their teeth formed, it’s even possible to count these growth lines (from an accentuated line in enamel that marks birth) to figure out how old they were when they died. Then, researchers can compare the stage of dental development – how far tooth growth had proceeded – to the stage of dental development that modern humans achieve at equivalent ages. From such studies, anthropologists have found that early in human evolution, among Lucy’s kind, teeth developed on an accelerated schedule, suggesting that our ancestors grew up more quickly than we do today. Later in time, with Homo erectus, periods of dental growth and development began to lengthen. Though not perhaps evolving for this reason, long childhoods afford humans time for learning and mastering complex skills that are crucial to our survival and reproduction. In my own research, I’ve used teeth growth lines to understand patterns of enamel growth as well as enamel growth disruption. These have revealed some interesting things: Neanderthals, for example, show evidence of living through physiologically stressful events, such as illness or malnutrition, that disrupted their forming enamel during childhood. Some of these events may have lasted up to three months, as assessed through counting growth lines on the enamel surface. That finding makes sense, given Neanderthals have traditionally been thought to have had hard lives. 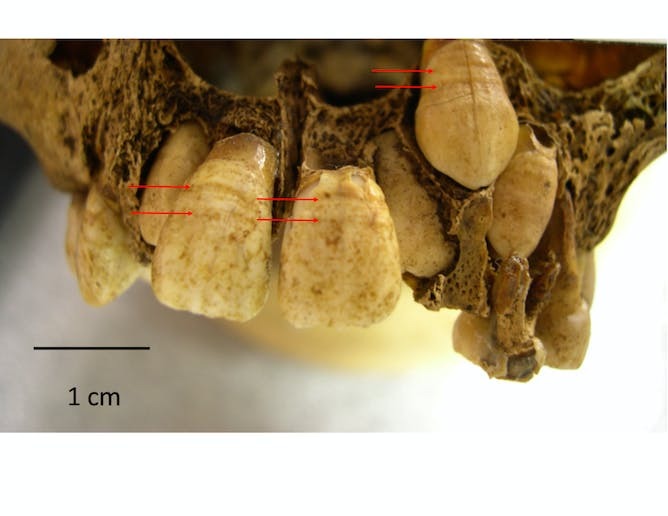 We’ve found similar enamel disruptions in the teeth of some traditional modern human hunter-gatherers. The teeth of ancient Inupiaq of Point Hope, Alaska, who lived between A.D. 1300 and 1700 exhibited these same long periods of disrupted enamel growth. Future dental anthropologists, say 10,000 years from now, will have a field day with our fossilized teeth. If they analyze our enamel chemistry, they’ll be able to determine which of us grew up as vegetarians and which did not. Perhaps they will be surprised to see that humans from the same population groups had such differences in diet. But, more likely, they’ll interpret these interpersonal differences as a natural extension of our evolutionary biology – our large brains allow us behavioral flexibility, including the adaptive ability to eat diverse foods. Future anthropologists will also be amazed by the extent of our dental problems. A few cases of dental disease exist in the human fossil record, but today we are heavily afflicted by malocclusions (when teeth don’t come together correctly), third molar impactions, caries, periodontitis and other dental maladies that will leave their marks in our remains. Papers given at scientific meetings of the future may draw upon the idea of “evolutionary mismatch” – that the hunting and gathering diets of our ancestors did not prepare us for the rapid influx of soft and sugary foods that we eat today. Essentially, we are not adapted to the modern Western diet. The foods our hunter-gatherer ancestors ate were tough to chew and did not include refined sugar. Soft foods don’t stimulate jaw growth during childhood, leading to malocclusions, and sugary foods provide environments for caries-causing bacteria to thrive. In fact, by extracting bacterial DNA from calcified plaque in ancient teeth, one group of anthropologists found that caries-causing strains of bacteria became more common with the advent of agriculture. These strains especially flourished in human mouths during the Industrial Revolution, with the first mass production of processed sugar. We’re still suffering these effects today. Finally, what will future anthropologists make of the myriad ways people alter their teeth? In Western cultures, people take great pains to artificially whiten their teeth. According to one study, conducted in the U.K., subjects found whiter teeth more attractive, especially in women. The researchers suggest that white teeth may serve as an age indicator in human mate choice, with males preferring white teeth as a signal of youth. 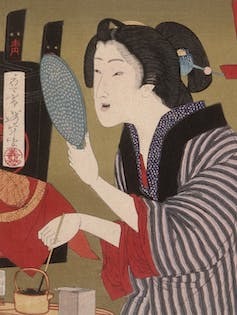 But, then, how does one explain the practice of “tooth blackening” in some traditional Asian cultures, which is also done for aesthetic reasons? And beyond that, how will future anthropologists make sense of the practices of notching teeth, sharpening them into points, inlaying them with jewels or gold, filing them down, or removing them altogether? These practices and others are found in different cultures, and future scholars will likely debate their reasons. So, the next time you forget to brush or find yourself in the dentist’s chair, remember this: Future anthropologists may ultimately be assessing those choppers. Visit elsevier.com to access content on anthropology, forensic science and more! Use discount code STC317 at checkout and save up to 30%!